I once read that the definition of true forgiveness is to no longer see the other person as wrong! Wow! I mean if I didn’t think that they were wrong to begin with, I wouldn’t have a need to forgive them right? But now if I have to no longer believe that they are wrong, well, that puts a whole new spin on forgiveness doesn’t it? When God forgives us, he wipes the slate clean. The bible says it’s as if the sin had never been…yep, that pretty much says I am not wrong. I have a completely new beginning. I think that’s the forgiveness that God want’s from us as well. To wipe the slate clean towards our brother, as if the infraction had never been…as if they had never wronged us! That is a challenging definition of forgiveness, indeed. To contrast that with a different thought, I’ll refer to Curtis Almquist, another spiritual thinker I very much admire. In Unwrapping the Gifts: The Twelve Days of Christmas, Almquist examines the etymology of forgiveness and suggests it is not about forgetting. We’re often urged to forgive and forget, but is that as powerful as forgiving and remembering? To remember the offense in all its meanness, thoughtlessness, malice or spite, and nevertheless in the very presence of that reality, to release resentment and all claim against the offender can be a greater offering and act of love than somehow vanquishing the offense from our consciousness. Some may be able to blot out the offense as if it never happened when releasing resentment, but for me personally it sounds like a slippery slope towards repression and denial. I am one of those challenged by the “forget” part. Almquist helps by pointing to the blessing in the tensions we feel with those who give us a reason to forgive or those with whom we don’t get along. He calls them “enemies,” a strong word but the one Jesus used for all who fall outside the categories of family, friend and neighbor. I’ve changed my mind about enemies in several ways. For one, Jesus tells us to love our enemies, not because it makes for more pleasant living (although undoubtedly it does). Rather, we’re told to love our enemies because they may also be our teachers, perhaps even our best teachers. Our enemies can get us in touch with “our stuff” like no one else can… Our enemies expose us, and I believe that they are extraordinary agents for our own conversion. In this new year of life, as we reflect on where we’re headed and what is in our way, perhaps we can hold up, appreciate, and even love those people who are burrs under our blankets for the insight with which they grace us on our journeys. Join the conversation. Who is your fellow traveler who best exposes the life change your soul craves? ‘Tis the season for new year’s resolutions. Maybe I’m more tuned in than in years past, but everywhere I look I see commentary about making and breaking new year’s resolutions. I’ve seen thoughtful encouragement to adopt a one-word resolution to serve as a focus area, cartoons about resolutions being a to do list for the first week of January or being recycled year after year, and much in between. 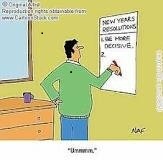 For my part, I tend to think of new year’s resolutions as course corrections. No matter the goal, we all need course corrections. And we need them continually, even when we know our life direction and have a plan for getting there. The last post described sailing in a fog as a real life metaphor for navigating life, and it acknowledges that sticking to a plan is hard. Anyone experienced with weight loss resolutions can tell you that. As if steering the course were not challenging enough, changing conditions can interfere with the journey we planned. What was intended as a short sail across a sound looks completely different when the wind dies and fog rolls in. Adroit navigators stay alert to their location, heading, and conditions at all times. They make frequent adjustments to stay on course to the intended destination. At times, one’s course may need only a few degrees of adjustment. Other times, we may need a total turn-around. How do we know which we need? I say forget about resolving to lose weight, to work longer (or shorter) hours, or to put more money away for retirement. Instead, assess where you stand with God. It seems that much of what is going on in our lives reflects, or flows from, what is going on in our spiritual lives. Maybe I overeat while the real nourishment I crave is divine sustenance. Maybe exercising discipline to make time to be present to God every day would strengthen my discipline for other self-improvement actions. Maybe rearranging my priorities to put God in the center will allow other desires to fall away effortlessly. 10 years ago, my relationship with God was more______ and less _____. 1 year ago, my relationship with God was more______ and less _____. In 5 years, my relationship with God will be more______ and less _____. Of course, this exercise can be applied to any relationship or personal attribute, but I would suggest starting with God. Allow yourself to feel where there are tensions are in your relationship and perhaps where connections are loose or missing. Think about what you want that relationship to be like and the adjustments needed to make it so. Ponder how God is present to you and how you want to respond to him. Join the conversation. Is there forgiveness you need to receive or to extend? Washington’s San Juan Islands are a spectacular boating destination and the scene of my most harrowing experience sailing. I am dating myself here, but my visit was before cell phones had GPS, and sailors relied on navigational charts. We anchored near shore at night to enjoy an island’s charms, and in the morning we made coffee and got out the charts. We pinpointed our location, decided where to sail that day, and determined the compass heading for getting there. The last morning of our trip, we had planned a quick sail across Puget Sound to return our charter boat to its Bellingham harbor before driving 100 miles to Sea-Tac to catch our flights home. 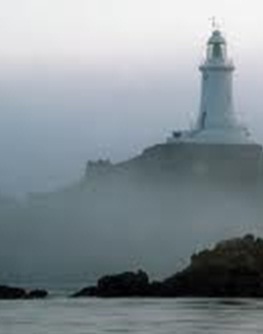 We awoke, however, to a thick fog and no wind. We couldn’t see from the bow to the stern, much less to the island protecting our anchorage. Boats swing around their anchors with changes in current and wind direction, and we couldn’t even guess where the island was without a compass. We were completely disoriented. Morning fog was not atypical, though, so we had coffee and waited for it to lift. It didn’t. We started calculating backwards from our flight departure, allowing the minimum time for boarding, returning the rental car, driving 100 miles, checking in the boat, and so on. When our last ditch time for shoving off arrived, the fog had lifted only slightly, so we faced a tough choice. We were young and foolhardy and had nonrefundable tickets, so we weighed the anchor and motored slowly, steering by compass towards Bellingham. Knowing your correct heading is one thing, but actually steering to it manually under power is another matter entirely. It’s easy to drift too far one way and then to overcorrect in the other direction. The helmsmen wrestled the wheel continuously, leaving a serpentine wake in the mist behind us. After meandering this way for several hours, we started feeling a little desperate. We no longer knew where we were or where we would be when we sighted land. We didn’t have time to spare cruising up or down the shore looking for Bellingham. As anxiety mounted, I thought I heart a faint horn in the fog. All ears onboard strained to make out the sound and its direction. Several minutes later someone else heard it. It was two horns at a regular interval. I dashed below to consult the chart and found a lighthouse sounding two blasts at one minute intervals. That was it! We still didn’t know where we were, and the lighthouse was significantly south of Bellingham, but if we could steer to the foghorn until we saw shore, we would at least know the direction to head to reach our harbor. In the end, we arrived safely and made our flights. 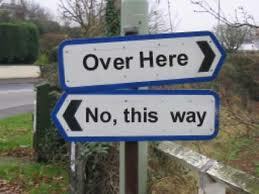 It strikes me that navigating life is not unlike this. Sometimes we are close to shore and know exactly where we are. We don’t need a compass because the destination is in plain sight. Other times it feels like we haven’t seen land for days, like sailing across an ocean without GPS. Maybe we have forgotten where we’re going or circumstances have forced us off course. Checking our bearings periodically is essential for the long haul because if we go a long way, heading just a few degrees off course can land us hundreds of miles from our intended destination. The start of a new year invites us to ponder where we are headed and the course corrections we need. Join the conversation. When did you last check your bearings?